The renaissance in the field of mental retardation since World War II has been expressed both in research and in renewed practical concern for the plight of the retarded. The 1958 monograph by Masland, Sarason, and Gladwin entitled Mental Subnormality: Biological, Psychological, and Cultural Factors was one spur, if not the only one, to much of the behavioral research which emerged in the late 1950's. Similarly, the Handbook of Mental Deficiency, edited by Norman Ellis and published in 1963, gave theoretical direction to many studies in the years following its appearance.The present book and the symposium on which it is based are an attempt to continue this tradition by presenting theory-based, programmatic research in mental retardation, aimed at the scientific understanding of the psychological processes involved. 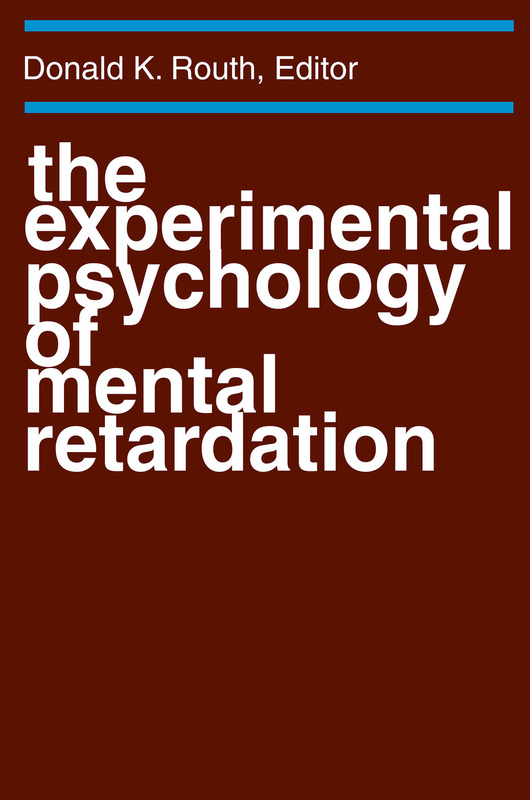 The final chapter attempts to draw some of the implications of this research for the practical assessment and remediation of retardation.The experimental work reported in this book generally uses rather traditional laboratory tasks, for example, classical conditioning or discrimination learning. But the interest is in underlying processes rather than in such apparent trivia as whether the child blinks his eyelid or which of two stimulus objects he selects. Thus, this book is oriented around the psychological processes of interest, namely learning, attention, memory, language, thinking, and emotion, and concludes with a section on the relationship between these processes and the biological aspects of retardation.